Driving a lot of different vehicles, I’ve develop a mental checklist of things I notice and enjoy. And certainly, I’ve developed some personal biases toward certain types of vehicles. We all have our favorite kinds of cars. Some like powerful sports cars, or big, capable trucks. Me, I lean toward smaller, nimble cars that don’t need huge horsepower to be fun. So, needless to say, my tester this week had me all giddy as it fit that bill perfectly. And it covered a bunch of mental checklist items too. Sporty looks – check. Fun to drive – check. Good touch points – check. Comfortable seats – check. For me, two doors make the styling on a car look so much better, so also put me down as someone who leans toward coupes. 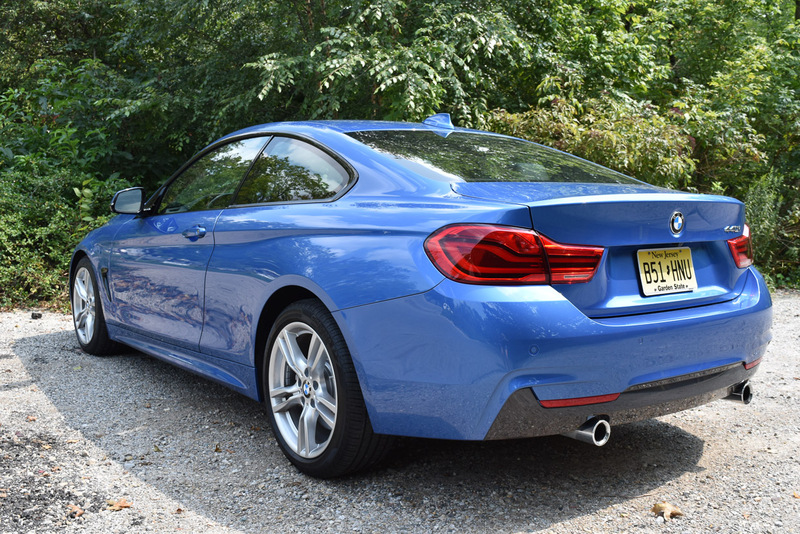 The BMW 440i is a small turbocharged coupe. 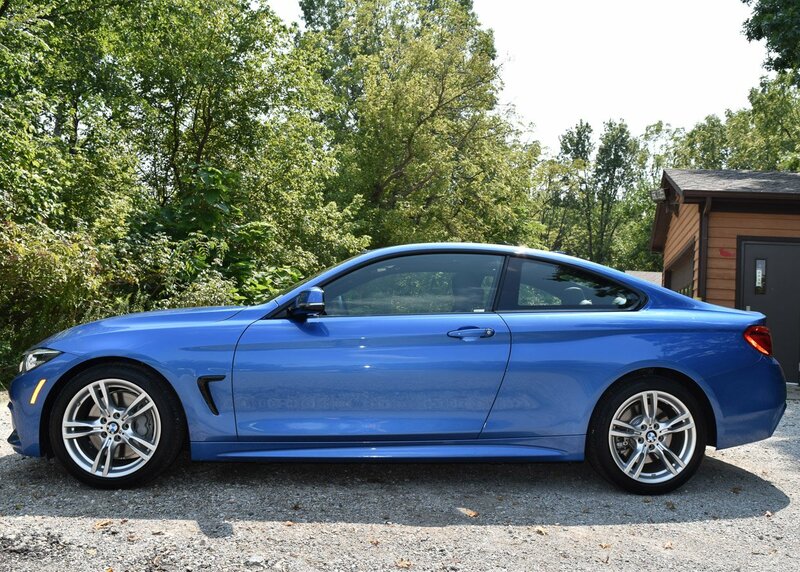 The 4-series is also available as a sedan, but just looks sportier and more stylish as a two-door coupe if you ask me. The sharp, angled cut of the door flows beautifully down the side, giving the car a finished, streamlined profile. 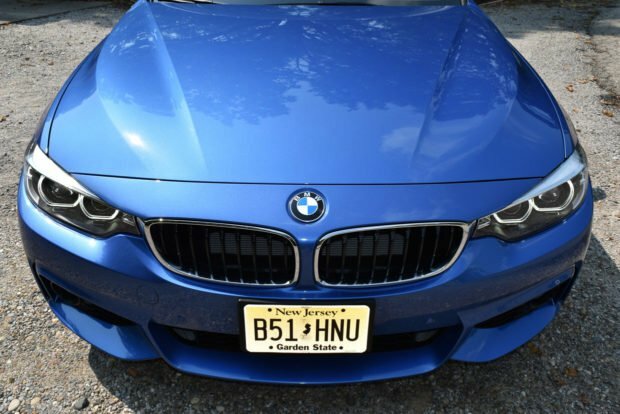 The front end is very typical BMW, and that’s not a bad thing. The iconic Bimmer styling is enhanced with some modern updates, including adaptive LED headlights, new for this model year. It’s broken into two levels, with the iconic kidney grille up top, then a a second, sportier grille with the fog lights embedded below. 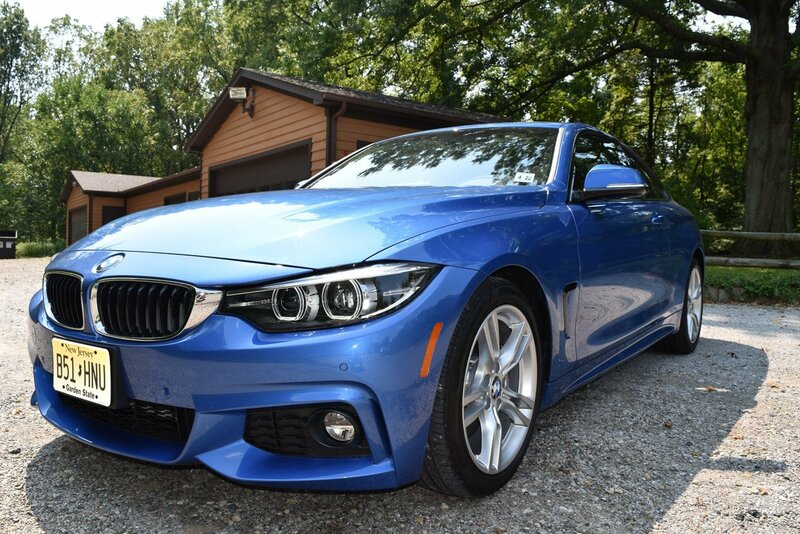 The M-sport package contributes even more aggressive looks to the 440i adding 18-inch star-spoke tires, among other things. The back end styling definitely feels more reserved. I think the back side is the least attractive side of this car, although the twin pipes hint that it has some punch and personality – and that’s certainly the case. There are three engines available on the 4-series, starting with a 2.0-liter four-cylinder turbo that makes 248 horses. My tester was the 3.0-liter twin turbocharged six-cylinder which made an impressive 320 horses. The performance-driven M-sport version of that engine cranks out 425 horses. It would’ve been fun to drive that one, but as driven, the 440i has plenty of power. This rear-wheel drive car is driver-focused with its fine-tuned steering and the suspension. You’d be hard-pressed to find another coupe that’s as enjoyable to drive than this one, if you ask me. The 320 hp feels more like 400 hp when you adjust the driving dynamics of the four different driver modes. The Sport and the Sport + live up to that name and offer responsive steering, agile braking and nimble handling. Even in Eco mode, the 440i is fun. 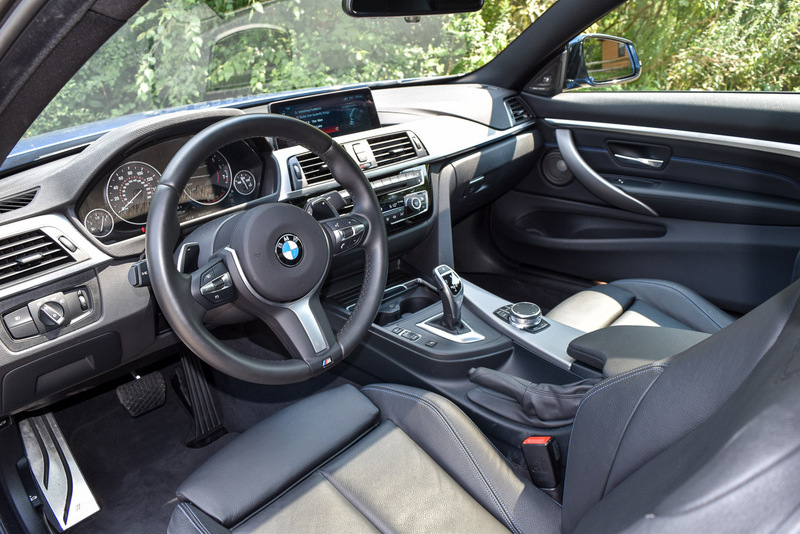 My tester came with an 8-speed automatic transmission, but many BMW purists will opt for the six-speed manual for ultimate driving performance. But with the automatic transmission in place, shifts are quick and there’s no noticeable turbo lag. The paddle shifters can amplify the enjoyment as well. Fuel economy surpasses 30 mpg, on average, which is good for such a fast, spry car. The efficiency of the engine, along with the transmission makes this a fuel-economy winner. As such, the 440i has an EPA rating of 21 mpg/city and 32 mpg/highway. I averaged 29 mpg, with plenty of lead-footed driving through a mix of suburbia and some highway time. Front passengers will enjoy high-quality touchpoints and 14-way adjustable seats. For a luxury brand, this car doesn’t hold back, but it also doesn’t overpower with luxury either. It finds the sweet spot for premium, quality materials and then adds in the M-sport features that give it a more technical vibe. Dark aluminum trim is found throughout, and the racing-inspired sport seats had blue stitching that was a subtle, but beautiful touch. Sometimes it’s hard to find the comfort zone with sport seats, but I quickly found the right setting melted right into the seat. 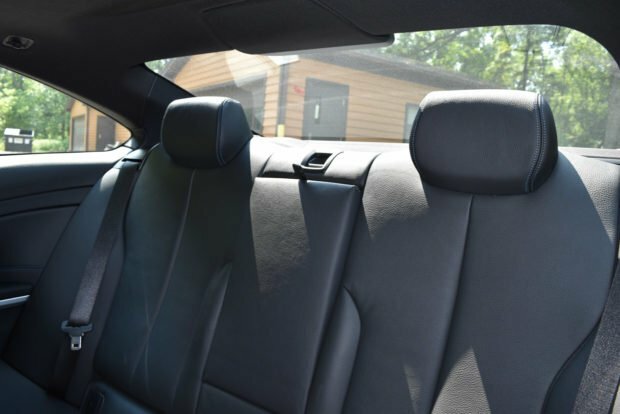 Too often, cars are classified as 5-passenger vehicles, when there’s no way a third person in the back row would be comfortable. So, it’s refreshing that BMW is honest with its four-passenger classification here. With an armrest and cup holders dividing the two seats, leg, shoulder and headroom are adequate for even two full-size passengers. The sloped coupe styling usually eats into headroom, but that’s not the case with the 440i. The coupe version also has the largest trunk of the 4-series, with 15.7 cubic feet of space. Plus, there are split-folding rear seats to increase the available cargo room. All too often, German cars feel over-engineered when it comes to their infotainment systems. The system for the BMW is a perfect example of this. While there’s a lot of technology and some cool features in the iDrive system, the system is generally complicated and lacks intuition. The touchpad controller is very sensitive and can be downright frustrating at times when changing between menus. Still, the 8.8-inch display responds well to touches, and the center stack is neatly organized. The touchpad is really the only deterring factor of this otherwise feature rich and enjoyable system. The system also packs a wi-fi hotspot, and a 16-speaker Harmon-Kardon sound system that really enhances things. It also integrates easily with phones through Apple CarPlay and Android Auto. 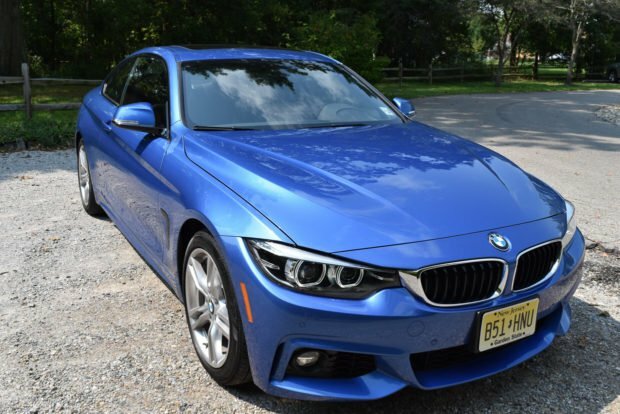 As is always the case with German cars, the options and packages available can make this car quite pricey. As a small, starter-type of luxury car, the 440 has a reasonable entry price of $48,700. 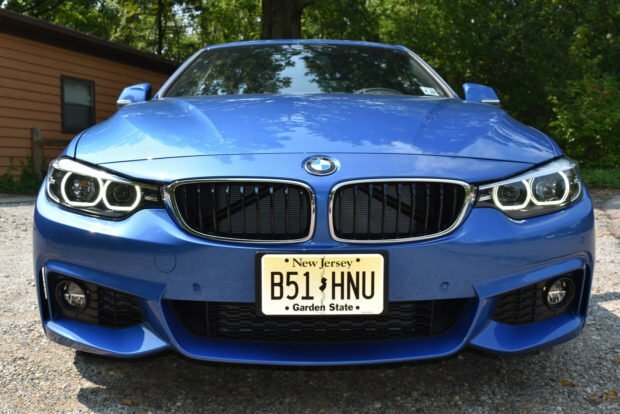 My tester, with three different packages, including the aforementioned M-sport package along with the Essentials and Premium packages, had a final MSRP of $56,245. BMW still markets itself as “The Ultimate Driving Machine.” And once again, I have to tip my hat to the accuracy of that marketing statement. The 2018 BMW 440i coupe is a thrill to driv,e and offers plenty of comfort inside and snazzy looks to make it a standout on the road.